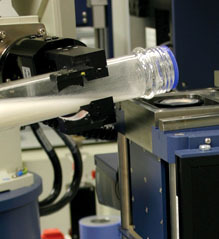 Our Falcon filtration robot assistant focuses on filtration and washing. This state-of-the-art platform collects all the data you need to deliver understanding of your filtration and washing processes by combining real-time machine vision with robotics. Repetitive tasks are performed day and night with high levels of precision and accuracy. The Falcon uses automated filtration studies to carry out all the tests you need to determine the characteristics of your solid liquid-separation under diverse processing conditions. The platform can be used in a range of studies to add value to your processes by optimising the filtration and washing procedure, predicting processing times on scale-up, aiding equipment selection and troubleshooting. Although originally designed to optimise the isolation of solids, the capabilities are equally suited to applications where isolation of the liquid phase is the priority, such as oil filtration. User friendly software for easy operation. For a full description of this filtration equipment, download our Falcon brochure plus case study and take a look at the videos in our related links.